Posted August 1, 2018 by Charles Morris & filed under Features, Infrastructure Features. The two-billion-dollar 10-year investment represents the largest of its kind so far. In the chaos that is human affairs, bad intentions sometimes eventually lead to good results. 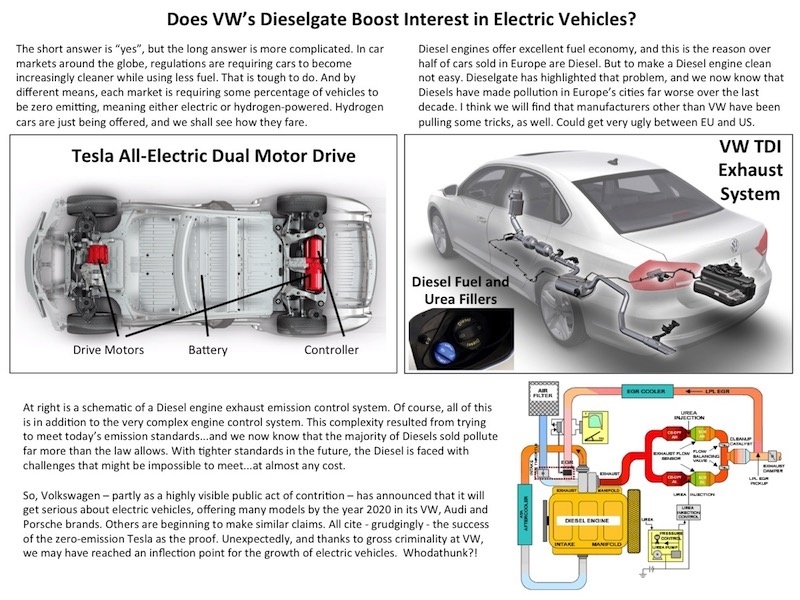 As atonement for Volkswagen’s criminal actions in what we like to call the Dirty Diesel Debacle, government regulators have forced the automaker to invest substantial resources in promoting vehicle electrification. As one of these acts of contrition, VW agreed to a consent decree that established Electrify America, a corporation with a mission to increase EV adoption and a budget of two billion dollars to be invested over ten years in charging infrastructure and a brand-neutral consumer awareness campaign. The two big ones will be invested in four cycles of $500 million each. The idea is to future-proof the project by spending the money over time, learning from each cycle before deciding how to proceed with the next, and taking advantage of the inevitable advances in charging technology. In the first cycle of investment, Electrify America is building 484 DC charging sites in 17 metro areas and along highways, and deploying more than 2,800 Level 2 chargers at 500 workplace and multi-unit dwelling (MUD) locations. EA has already begun installing stations. Six or seven should be up and running by the time you read this, and the rest of the first phase is scheduled to be completed or under construction by June 2019. To understand what a big deal this is for EV adoption, let’s look back at a previous turning point in tech history. In the late 1990s, internet developers envisioned applications such as audio, video and telephony, but existing bandwidth was inadequate. Over the course of a few years, telecoms rolled out fiber-optic backbones around the world, and developers quickly took advantage of the new infrastructure, creating the modern broadband internet (for better or for worse). Today, it’s plain that existing fast charging infrastructure will be inadequate for the new generation of long-range EVs that’s in the pipeline. Electrify America’s network, combined with a wave of other fast charging networks now being built in various state-level projects (to say nothing of Tesla’s frenzied expansion of its Supercharger network), will create a nationwide web of chargers that will make topping up an EV almost as fast as fueling a fossil-burner, making long road trips practical and eliminating one of the main objections cited by would-be EV buyers. Charged recently chatted with Brendan Jones, Electrify America’s first official employee and now the company’s COO in charge of business development and operations. From what he told us, it appears that Electrify America is going about things the right way, moving quickly but methodically, with plenty of input from interested parties, and learning from the mistakes that were made in previous waves of public charging deployment (for example, poor site selection, insufficient attention to ongoing maintenance, and unnecessary complications for users). It’s no wonder the company has a sound buildout plan, considering the all-star EV charging team it is assembling. There are few in the US with as much practical EV experience as Brendan Jones, who has been at the forefront of the industry from the early days. Before joining EA, he was Nissan’s Director of EV Sales beginning with the launch of the first LEAF. In those days, Nissan was heavily involved with deploying the first fast chargers in key US markets. After learning first-hand that infrastructure and EV sales go hand-in-hand, Jones joined charging network operator EVgo, before being hand-picked to lead Electrify America’s ambitious rollout. As a new generation of EVs begins to appear on the roads, ranges are getting longer, and this means charging levels need to get higher. Several OEMs are developing DC fast charging technologies that operate at 150 kW or above. Porsche has demonstrated a new system that can deliver up to 800 V and 350 kW. Of course, pushing more wattage through a cable means more heat (or a thicker cable that would be impractical for users), so liquid-cooled cables are de rigueur for the new generation of high-power chargers. Jones told us that all of EA’s 150 and 350 kW chargers feature liquid-cooled cables. Unlike the Level 2 program, which allows site hosts to set their own pricing policies, the DC Fast Charging Network currently offers consumers a regional rack rate available through a credit card purchase. An Electrify America app that people can use all over the country is expected to be available in Q3 of 2018. By Q4, EA plans to launch more pricing models in addition to the plain vanilla pricing that’s in place now. “Those will be subscription services and then customized programs for OEMs or other groups that want something different than rack-rate credit card,” says Jones. EA aims to make pricing as transparent as possible – each station will have a large screen with real-time updated pricing and an estimated cost over time. Greenlots is providing a purpose-built back-end platform that will manage all of the chargers, including maintenance and customer relations. It will also provide back-end capabilities for apps and web sites as those are supported. “All the vendors achieved their certification – we have all of the production samples in, and we have a lab where we are testing them. So it seems that we made the right decision going with the four vendors. We’re also splitting up the volume because they are all constrained in how many of these pieces they can build in a short period of time – we are buying more than 2,000 of these chargers,” said Jones. One important lesson that’s been learned over the past few years is that different forms of charging are appropriate for different situations: DC fast charging along highways and in city centers; and Level 2 at workplaces and multi-unit dwelling (MUD) locations such as apartment buildings. Electrify America has chosen to keep these two charging programs separate. Under the Level 2 program, site hosts will own the chargers, but EA pays for the equipment and installation, and will be responsible for charger maintenance for 10 years or “until the consent decree is over.” Site hosts must cover electricity costs on their own, but they are free to set their pricing however they like, whether they choose to offer free charging or wish to try to recover electricity costs. Another important thing that network operators are beginning to understand is that ongoing maintenance is a big deal. Electrify America has wisely chosen to oversee maintenance for all of its stations, although it has contracted with a (so far undisclosed) company to perform the actual maintenance. Once the network is operational, it will be monitored through EA’s network operations center, overseen by Director of Service Operations Rob Healey (formerly of BMW). This article originally appeared in Charged Issue 38 – July/August 2018 – Subscribe now. good article and plans. The High power charging could cause power company problems as that would be over a Mega Watt of Power . The GRID already needs help and this could be bad with brownouts and maybe Blackouts. I had suggested they have at least 2 6 kW Level 2 ports at each Fast Charge area.for cars with no fast charging. I don’t see that basic idea in their plans. Too bad for Millions of Plugin Hybrid drivers. I’m pretty impressed with how seriously EA is going about this. No mere press releases here, they’re actually out trenching and pouring concrete. One concern, though, is the CCS/Chademo ratio. For example, Stratford, CT (https://www.plugshare.com/location/152891) has 15 CCS plugs and one Chademo. At a minimum, there needs to be two Chademo plugs, in case, for whatever reason, one isn’t working. Technically, the site covers all non-Tesla standards, but practically it has a bit of a proprietary whiff, since VW is CCS….. Both very good pionts. Electrify America is doing a terrific job of rolling out a desperately needed reliable high power fast charge network. The concern about the number of CHadeMO plugs per location is something I’ve raised as well, even with Electrify America. Unfortunately they have said they plan to only install one CHadeMO charger per location. I suppose if this trajectory continues Nissan will best switch to CCS ports on their vehicles. It’s simply not feasible to travel any distance while only relying on one CHadeMO plug at a given fast charge location.